What Happened to the Condors? A California Condor Egg In Russia? California Condors for Hell'S Canyon? Where Else Should We Introduce Condors? What Does A Condor Look Like? Was There Gold In Them Thar Quills? � But it still seems like there is unfinished business. � I don't obsess about condors. I can go whole days - well, parts of days, anyway - without them crossing my mind. A certain fixation on the species is understandable, I think; after all, condors have been a part of my life for sixty years. It started for me as an early teen, excited to find that a giant, almost extinct bird lived only a couple hours away from me in the central California mountains. The fascination stayed with me as, in my high school years, I hiked and climbed around the cliffs and spires of Pinnacles National Monument - in my mind at the time the epitome of "Condor Country." 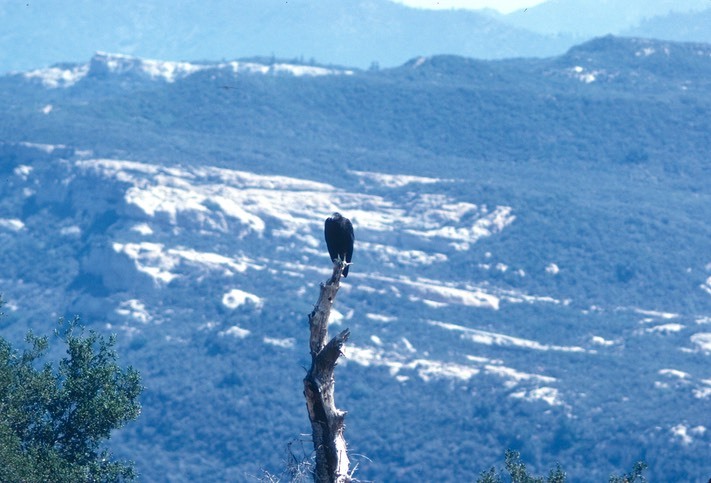 The Sixties saw me participating in the first two cooperative condor surveys, which ushered in ten years as chief condor researcher, and chairman of the California Condor Recovery Team. During the Eighties, as head of the Fish and Wildlife Service's western endangered species office, I saw the condor recovery program from the administrative side, and as an advisor to my bosses on certain condor-related issues. "Retirement" in the Nineties and beyond was a time of extensive museum and library work on the history of the condors, which led to three books about the big birds. I do feel I have a certain investment in them. The interest is hard to set aside. � �It's been a quarter-century since I had an active role in condor recovery. I never had any hands-on part in the current captive breeding and release project. Some of the people now involved were not even born the last time I saw a wild condor. Still, the reestablishment program is very personal to me. Without me, Dean Carrier, and a couple of others, it would never have begun, and the California condor would almost certainly be extinct.� This isn't undue self-congratulations or any attempt to re-write history; it's fact. Some of what occurred was serendipitous - right place, right time - but it took persistent "selling" for ten years to overcome the sociological and political barriers to captive breeding of California condors. Because of the rapid decrease in condor numbers through the 1970s, to only about 25 in 1980, "right time, right place" was really the ONLY time. Starting any later than we did would have been much too late. �� Having stated my background and interest in California condors, here's what I want to do with these web pages. First, because there are fewer and fewer people around who ever saw a wild condor, and few who know the details of the history of the condors and efforts to save them, I'd like to present some of the more pertinent background stories. A lot of them are significant not just to the condor story, but to the problems and strategies of preserving other vulnerable species and habitats. � �Second, I want to talk about the captive breeding and release program - what's good about it, what's bad, where it might be going next, etc. I'm particularly interested in the unresolved lead poisoning issue, and will talk about that in some detail. I also want to talk about some of the other places condors might be reintroduced, and perhaps create some discussion on how to make such future releases happen. Although this site isn't laid out in "blog" format, I hope you'll feel free to contact me with comments, questions, alternate opinions, other ideas, etc. Complete copies of both volumes of "Nine Feet from Tip to Tip: the California Condor through History" (Symbios 2012) are now available as �free downloads (PDFs). A somewhat updated and revised second edition of "Condor Tales: What I Learned in Twelve Years with the Big Birds" (Symbios 2004 and 2016) is also available. If you'd like a copy of any of them, let me know. A few copies of those books in print are still available, at close-out prices.